Four bedroom holiday villa with pool at Protaras, one of Cyprus famous holiday destinations with stunning beaches, good restaurants and shops. The villa is furnished to a high standard to ensure that our clients will enjoy a relaxing and stress free holiday. The beach, a large selection of restaurants, bars, a bank, supermarkets, and bakeries are all within easy walking distance. This excellent holiday villa is situated in a luxury beachside development, enjoying a unique location 500 meters from a sandy beach. The villa has an open ground floor with specious sitting room and fully equipped kitchen. It is fully air conditioned and built to high standards, using the best materials and luxurious furnishings. A superb Cyprus holiday villa in one of Cyprus best holiday resorts offering all year around excellent holiday accommodation. Free High-Speed Internet Access available FREE of charge. Three bedrooms are upstairs, air-conditioned all with double beds, inbuilt wardrobes, 3 bathrooms (1 family bathroom, 1 toilet with shower room & 1 en-suite toilet with shower room; all bathrooms have washing basins). One of the bedrooms has en-suite bathroom. Three of the four bedrooms are equipped with a dressing table. One double bedroom is downstairs. Spacious ground floor with open plan lounge, dining area, kitchen and a quest's bathroom. The dining area is furnished with a dining table that comfortably seats eight guests. Living room is with TV, satellite TV, DVD player. The kitchen is large, open plan with fridge/freezer, cooker, microwave, toaster, kettle, washing machine, dishwasher, ironing facilities, oven, extractor fan & all cooking utensils. 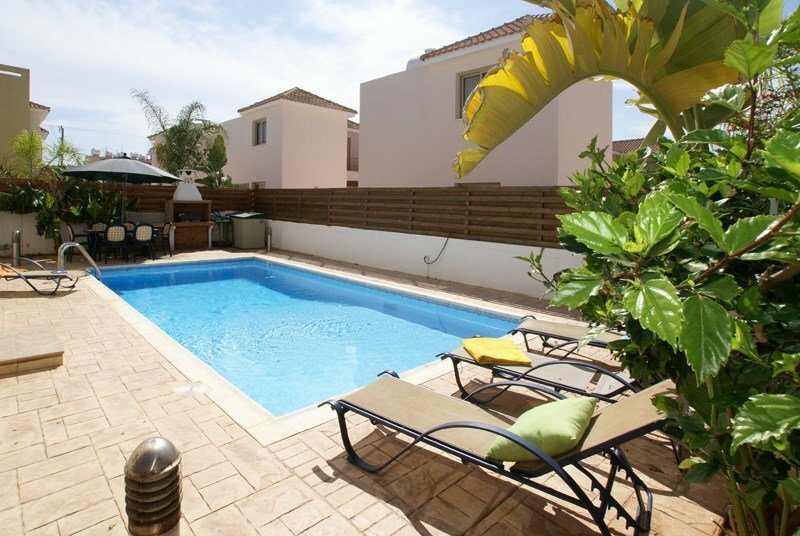 The Villa has its own private swimming pool (8m x 4m / skimmer), and garden patio area with sun loungers, outdoor shower, and a garden table and chairs. There is built BBQ and outdoor furniture for lovely BBQ nights. The garden is bordered by plants and fence, which create a pleasant feeling of seclusion. Extra camp bed, baby cot, and high chair can be provided upon request. Extra information The villa is located in one of the most attractive resorts of Cyprus namely Protaras-Ayia Napa area near Paralimni Village. A couple of minutes walk you will find the holiday village of Kapparis with bars, excellent taverns and restaurants, supermarkets, bank, a kiosk and car hire rental offices. Larnaca airport is about 40 minutes drive from villa Amore. Ideally situated and equipped the villa offers pure relaxation and family-orientated holiday on one of the most attractive Cyprus beaches. Just beyond Protaras is Cape Greco, which is located on the furthest southeastern point of the island in the Famagusta region. This area contains a National Park Forest, occupying an area of 390 hectares and offers facilities for hiking, picnicking, cycling, horse-riding, climbing, swimming and diving. Scenery and views in this area are some of the best on the island.